In an age of 3D and IMAX, modern audiences have become somewhat accustomed to cinematic gimmicks designed to boost ticket prices and draw in curiosity seekers. It's a trick nearly as old as the movies themselves, and in many ways that's exactly what the very first movies were - novelties flickering in the dark that curious thrill seekers could glimpse for a penny. Ever since, filmmakers have been looking for ways to make cinema bigger and better. From the dawn of the sound era, to Technicolor, to the eventual rise of the widescreen Cinemascope format that is still used to this day. 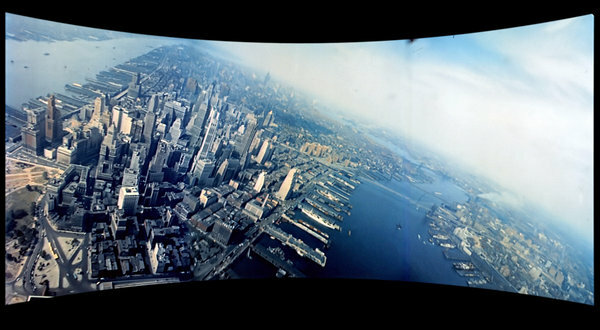 But before Cinemascope there was Cinerama, a short lived technique that involved shooting with three cameras simultaneously, and then projecting the image on three wraparound screens that gave the audience the illusion of a panoramic view. It wasn't exactly a new technique. Abel Gance had used something very similar in his silent epic, Napoleon, in 1927. 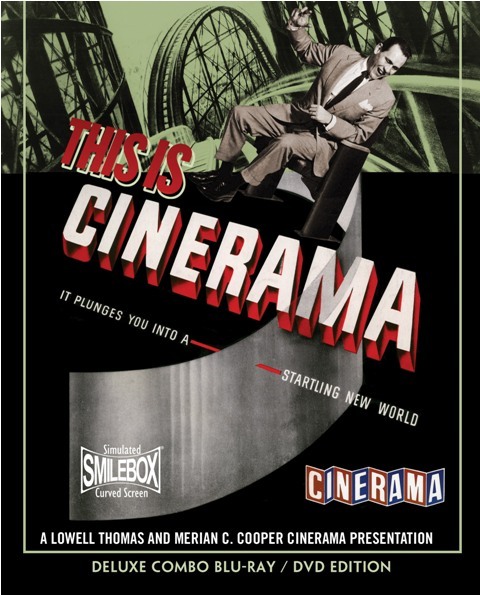 But in 1952, cinematic pioneer/huckster Merian C. Cooper (perhaps best known for directing the original King Kong in 1933) took Fred Waller's invention (which was awarded a Scientific and Technical Oscar in 1953) on the road with This is Cinerama, a two hour travelogue that is essentially a collection of scenes meant to showcase the new technology. Coming at a time when television was beginning to draw audiences away from the multiplex, Cinerama was one of many ways studios tried to convince people that the theater experience was something superior that they couldn't get anywhere else. In that regard, it came along at a time when, much like today, new technology (television then the internet now) was keeping viewers at home, and like the 3D of today, it was an attempt to stave off the bleeding with something grand (and, counter-intuitively, a bit more expensive). 3D also debuted around this time but proved to be more of a gimmick. Cinerama was something far grander and more ambitious, and as such much more expensive, making it a very short lived phenomenon. Only a handful of Cinerama films were produced between the years of 1952 and 1962, and its demonstration reel, This is Cinerama, remains the most legendary. It must have been something spectacular indeed to have been witnessed in its original glory. After a 12 minute black and white standard format prologue, the curtains pull back on the surrounding screens to reveal a rip-roaring roller coaster sequence that sets the stage for the film to come. Taking us from stage performances of Aida, to a thrilling boat race through the Cyprus Gardens, to a sweeping aerial tour of the United States, This is Cinerama pulls out all the stops in its attempts to shock and awe. Unfortunately that does not necessarily a good film make. That is not to say that This is Cinerama is a bad film, it's just hardly a film at all. It's a demonstration reel, meant to show what the new technology can do, and little else. As such, it's more of a historical curiosity, more notable for its place in cinema history than for its artistic merit. It's easy to see why such a film became so wildly popular, but like its opening sequence, it's basically a carnival ride. It's undeniably beautiful; even on a small screen the aerial photography remains stunning, and the curved "Smilebox" format (shown above) allows your television to recreate the panoramic effect as best as a small screen can. Still though, this is something that is meant to be seen not just on the big screen, but on three big screens, and while seeing it on blu-ray brings this legendary film home for the first time for a whole new audience to discover, it has to lose something in the transition from its original format to the very medium it was designed to trump. That being said, the blu-ray presentation by Flicker Alley is second to none. Putting together a package to rival the Criterion Collection, Flicker Alley has given the film the impressive treatment that it deserves. They have not only preserved an important piece of cinema history, they have enhanced it through comprehensive supplements that place it in its proper historical context. From a recreation of the original program, to a commentary track by Cinerama historian David Strohmaier, as well as original crew members Randy Gitsch and Jim Morrison, and Cinerama rep John Sittig, to the curious short that would play if there was ever a problem with the projector, Flicker Alley has provided a stellar presentation that is a veritable feast for film enthusiasts. Also available is Louis de Rochemont's Windjammer: The Voyage of the Christian Radich (1958), a travelogue about a Norwegian square-rigged sailing ship, that was produced by Cinerama's competitor, Cinemiracle, which was later bought out by Cinerama and shown in the Cinerama format. Flicker Alley's treatment on both films is equally sumptuous, and actually eclipses the quality of the films they are showcasing. Cinerama may have long since fell by the wayside, but through this impressive blu-ray treatment, it lives on in much smaller form for a new generation. It's one of the most important home video releases of 2012. Available today on blu-ray and DVD from Flicker Alley.